The Falcon Trail is on the grounds of the Air Force Academy. To get to the trailhead, you will need to enter the academy at the north gate entrance unless you have a military ID. I would advise you check the website for the academy to get the lastest information about access to the academy as it can change quickly. If you have old maps of the Falcon Trail, throw them away. It has been revamped recently and the old maps might cause confusion. We tried to find the trail by parking at the rec center as recommended by one old map guide only to find ourselves hunting around for about a mile til we found the trail. The next time I ran the course, I decided that starting by the Stadium was the best spot since it means that you will have downhill for most of the last 4 miles or so of the course. 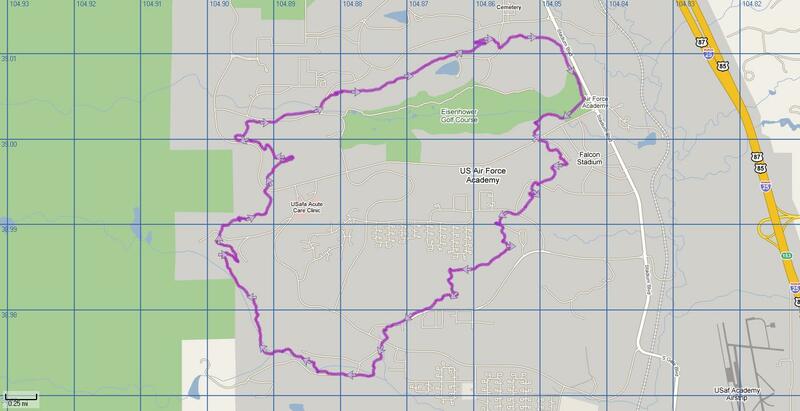 The new trail is 13 miles long and winds around the Academy. The scenery along the trail is great. The trail is single track but not too rocky and seems to have weathered nicely over the last 2 years that it has been redone. Only a couple of places might a novice trail person want to walk their bike or watch their footing during a run or hike. Running the trail clockwise seemed to be the best option for have downhill/easy trail to finish. This turned out to be good as the trail took a bit more out of me that I was expecting. The Stadium is about mile 5 on the markers. The trail will do a series of climbs and descents over the first 10 miles with the high point of the course at 6.5 miles. 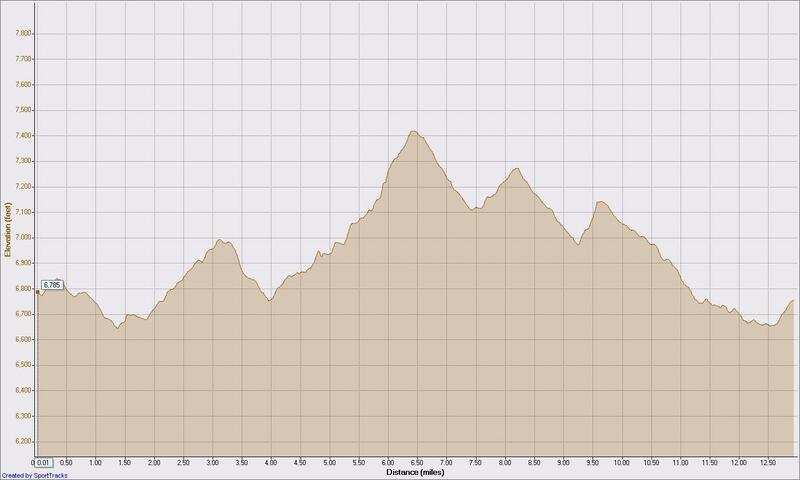 There are still a couple of climbs to be had but by mile 10, most of the heavier climbing is done. At this point, you can cruise to the parking lot. If you start at the official trailhead, you will have climbs from either direction back to the trailhead. Starting at the stadium, the trail heads south behind the stadium. I winds around and then climbs up to the commisary area. It passes behind the gas station then follows the roadway down to Pine Drive and across the road near the firestation. From here, the trail heads south then west and parallels the road to the water treatment plant. 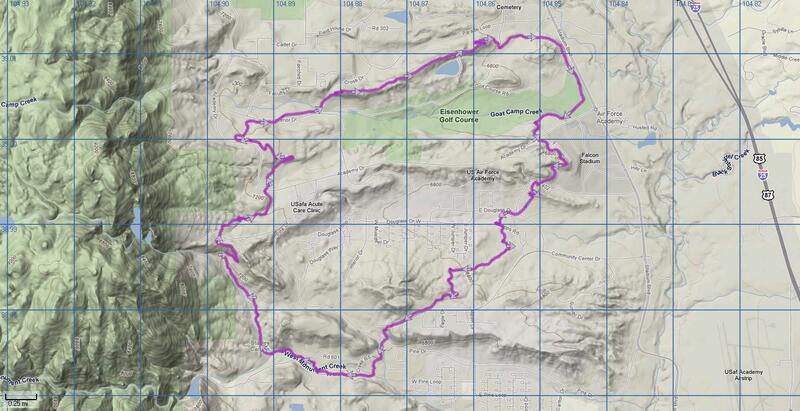 Here it will start to turn north and begin to climb as it follows the west range of hills. This is the most remote section of the trail. Here you will work your way north and then cross over a ridge and cross the entrance to stanley canyon reservoir trailhead. The trail continues north and then climbs up to where the official trailhead is found. From here, you will descend and cross below the Cadet area then climb back up on a ridge which you will follow down almost to Academy drive then turn south and wind back to the parking area where you began. Copyright (c) 2009-2012 Bob Shaw All rights reserved.